How should I set targets for the long vowel sounds? This is quite a tricky question but the important thing is to practise the long vowel sounds in a systematic way. What’s on the target sheet? On the Catch Up® Literacy target sheet, there is a heading for ‘Phonic knowledge’ and two bullet points with space for the supporting adult to record which aspect of phonic knowledge the learner most needs to work on. How do I know which phonic skill to target? Decisions about what skill to target will be determined by the learner’s performance on the Catch Up® Literacy Assessment 3 (Phonic knowledge). Don’t forget: working on long vowel phonemes will only be suitable for learners who are competent at the previous stages of phonic knowledge. 1. 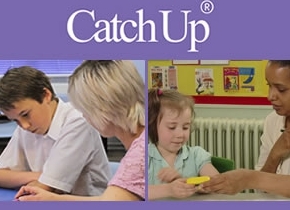 The Catch Up® Literacy session is not designed to initially teach long vowel sounds. The 6 minutes of linked writing in the individual session are an excellent opportunity for learners to practise segmenting and blending phonemes they have been taught elsewhere in the curriculum. Set two of these for the phonic targets but choose one at a time to work on in the 6 minutes of linked writing. Set two of these for the phonic targets but choose one at a time to work on in the linked writing. By now, the learner should have a good general understanding of the principle of long vowel phonemes and so it is time to introduce the alternative spelling options for some of the phonemes already taught. For example, oe (to link with ‘oa’) , oi (to link with ‘oy’) and ew (to link with ‘u-e). There’s not a lot of point in specifying these in the targets in separate bullet points, so the phonics target could be: Alternative spellings for long vowel sounds. Good luck helping your learners getting to grips with long vowel phonemes.